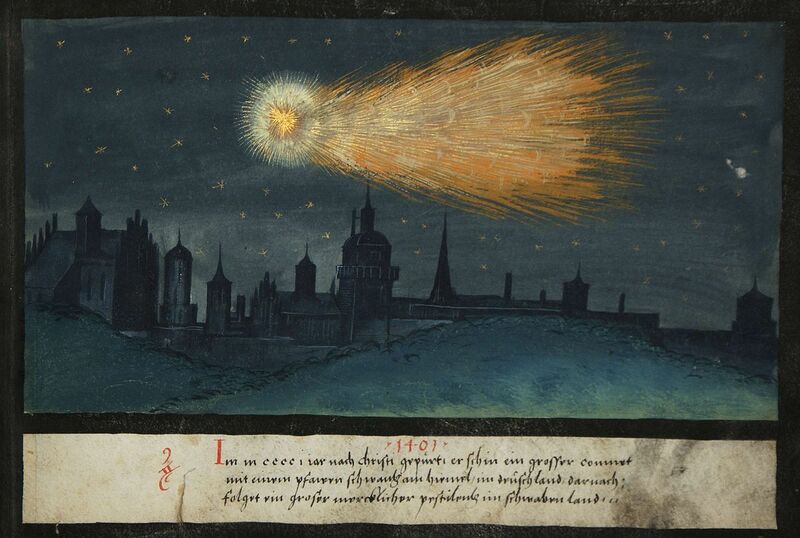 You may consider this post as something like a page from a scrapbook on the artistic records of historical comets and other celestial phenomena. The New Year in our current tradition begins with the first day of January which is named after Janus. In Roman religion, the animistic spirit of doorways (januae) and archways (jani). Janus and the nymph Camasene were the parents of Tiberinus, whose death in or by the river Albula caused it to be renamed Tiber The symbol of a gateway or doorway is indeed apt. However, most commonly we associate Janus with the ability to see into the past and future. I believe that every new beginning deserves a glance at the past, to see how we got where we are. 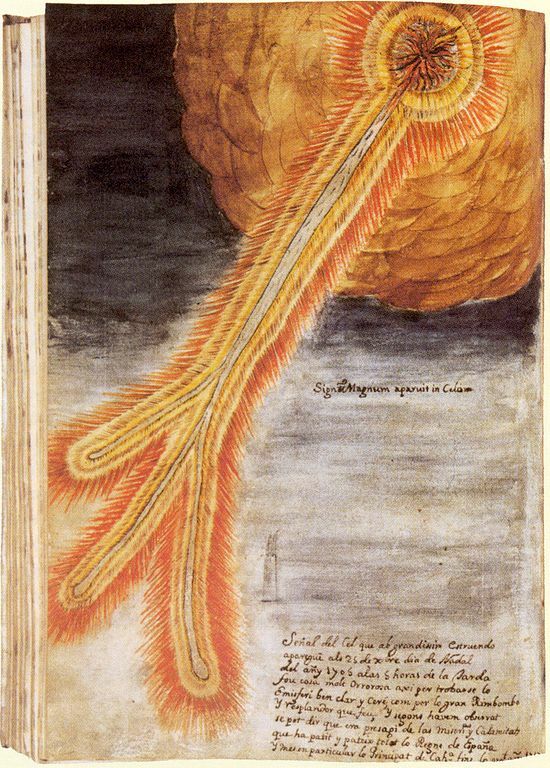 Animistic spirit doorways are what we pass through when we discover new ways to communicate our experiences and the authors and artists of The Augsburg Wunderzeichenbuch have done just that, The paintings do not attempt to provide a faithful rendering of a physical sighting. Instead, the comets are wildly expressive of their perceived nature. The simple and miraculous truth is that we are literally made of stardust. The heavens have had a vital role to play in all known civilizations. 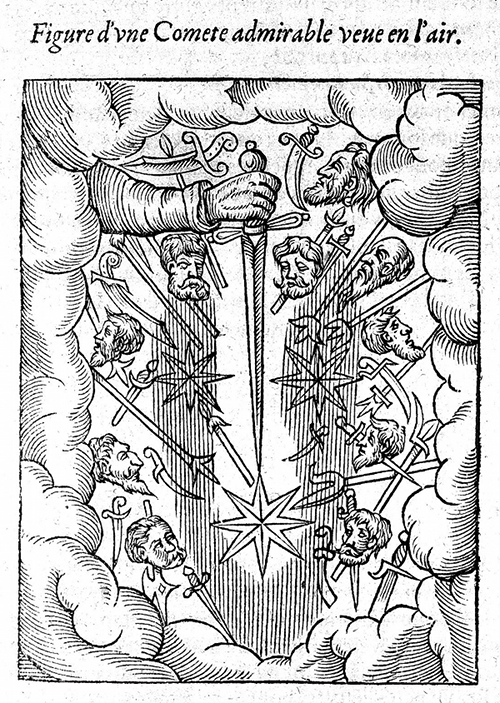 The comets shown here did, in fact, coincide with earthly events. “The figure of a Fearful Comet.” John Haygarth. Line engraving by W. Cooke, 1827, after J. H. Credit: Wellcome Library, London. Skywatching used to be a far more common practise, not least because the skies were clearly visible and without the modern levels of light pollution. In many cases, such as the examples given here from Whether we look to the past or the future we see signs that assist in prediction and make sense of extraordinary occurrences. Dramatic celestial events, even when feared as apocalyptic nevertheless elicited a sense of profound awe. The images of comets are magnificent, even if considered portents of doom. Some are from Biblical accounts imagined in reference to life in the 16th Century. Courtesy of The Warburg Institute Library The School of Advanced Studies -University of London. The book contains 167 colored representations of miraculous signs (portents) in the media of gouaches and watercolors The work is attributed to Heinrich Vogtherr and Hans Burgkmair the Younger.